For a show at the Wheeler Gallery in Providence, I rented a high-powered vacuum cleaner and vacuumed the carpeted floor of the gallery. The gallery and the stairs leading up to it yielded about 1½ cups worth of sand and other debris. I melted this in a converted microwave furnace to get a chunk of glass which I then took to a glassblowing studio and formed into a jar that later became the leyden jar. 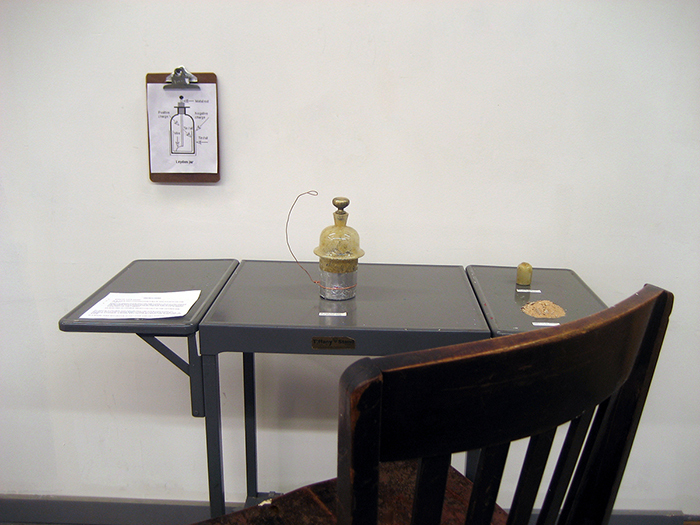 At the gallery, visitors were instructed to sit down at the desk displaying the leyden jar, a sample of sand collected from beneath the carpet, a diagram of a leyden jar, and instructions to experience the piece, then remove their shoes and rub their sock-covered feet on the carpet to charge the leyden jar with static electricity. When charged they could move the attached copper wire to the metal ball on top of the jar and release a spark of electricity. Being shown at a galley within a private school, the piece was set up to take on the aesthetics of a school science fair project. This piece was born materially and conceptually from the Wheeler Gallery and is hence a site-specific piece and can never be shown anywhere else.